Can't keep your hands off those fatty, salty, sugary foods? We asked Living Well readers how they stay away from the junk and load up on the good stuff. It can be so tempting to grab fast food or junk food when we're hungry and in a hurry. We asked Living Well readers what they do to make it easier to eat healthily and avoid high-calorie, low-nutrient foods. Whether you're watching your waistline, living with diabetes, or simply want to be your best, try these tips. It seems simple, but many readers said that keeping good food handy – and not having junk around – makes all the difference. Many readers admit they still give into their cravings, but they do it in a controlled way. 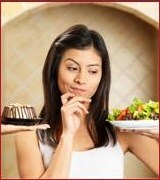 Perhaps the top way to avoid getting stuck in the junk food rut is to plan ahead. Don't leave your health to chance. Set some standards and stick to them. You're worth it! such a fabulous post it is. The problem with people is that they just can't avoid junk food. And when they stuck with health problems, then they think about it. So why to face such problems in the end. Avoid junk food and stay healthy.